The main aim of the board is to provide various services to the candidates in the state. The examination was held on 17th July 2016. 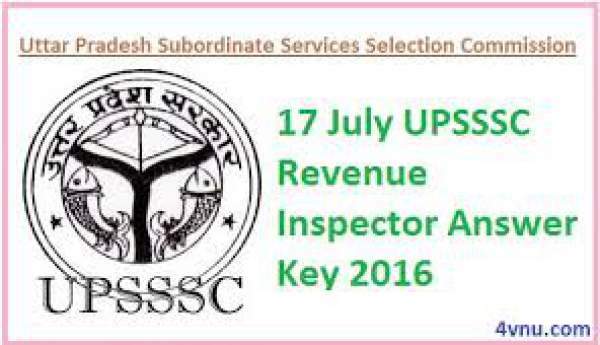 UP RI Answers Keys has been released by UPSSSC. The organization is headed by its one chair person, who get advised from other eight members who work under the chair person. Secretary of UPSSSC also works directly with the chair person. Uttar Pradesh subordinate service selection board (UPSSSC) again released one of the greatest recruitment of the year 2016-2017. UP Board announced near about 465 vacancies of the RI in the month of June 2016. There are 240 posts for general candidates, 122 posts for OBC, SC and ST shall have 94 and 9 posts respectively. The pattern of the examination is such that there are four subjects in this examination. Total two papers are conducted. Paper one is of general knowledge/awareness and general aptitude. Paper 2 includes general Hindi and general mathematics. UPSSSC RI asked 150 questions from each subject. Hence there were total 300 questions. Each paper carries 200 marks total of 400. To move for the next step, candidates need to score 50% marks. On 17th July 2016 examination, more than 10,000 candidates appeared across Uttar Pradesh. Uttar Pradesh Subordinate Service Selection Commission (UPSSSC) RI examination answer sheet for paper 1 and paper 2 for Set-A, Set-B, Set-C, and Set-D. All the candidates need to check one of the big exams of the year UP RI sheets will be updated in few hours. For the general category, the score is near about 230 marks in paper-1 and paper 2. For OBC it needs 220 in both the exams. SC will need to score 100 in paper 1 and 90 in Paper 2. St is to get a total of 150 marks in both the examination. Candidates must have to follow the steps in order to download the answer key. The first step is to open the official website of www.upsssc.gov.in. Then navigate yourself to UPSSS Board RI Ans Key Corner. Click on the PDF link to download the solution keys. Save UP Revenue Inspector Answers sheet on your phone/PC to calculate the marks. Stay tuned to The Reporter Times for latest education news and all government jobs updates across the nation. Don’t forget to share it on social media sites like Facebook, Twitter, Google Plus, and others to let others also know about it. All the best to you for your future. Previous articleA Flying Jatt Official Trailer: Movie Theatrical Trailer Video is Out!